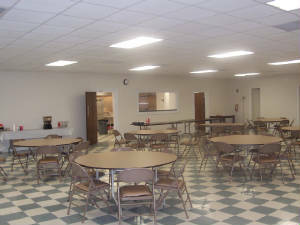 Our dining hall is available for the general public to rent. It is a perfect location for family reunions, birthday parties, anniversary celebrations, etc…. Our 4,000 square foot dining hall can seat up to 165 persons. Full kitchen facilities available. Call WB Darrell Cline at 704.791.9470 for pricing and availability. Please be aware: Alcohol consumption is now permitted when the customer pays a larger damage deposit, provides additional insurance coverage and written regulatory approval to dispense alcoholic beverages.